other is still up in the air. This week I'm working at Christel House Academy, a charter school up in Indianapolis. 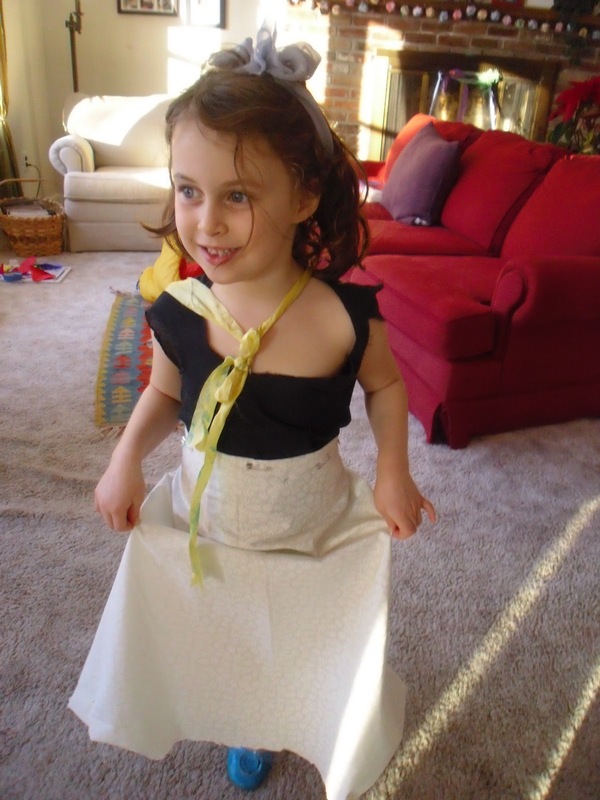 This is part of a grant-funded pilot project for Young Audiences' Signature Core Programs. The fifth graders are fantastic! They are perfectly perfect in all their 11-year-old-ness, and quite observant and thoughtful to boot. They make connections easily and ask interesting questions that show they are really thinking about how this all works. This is an interesting situation for me. I am usually invited to schools where kids are at least a grade level or more behind in math and my role is to assist in catching them up. At this school, the fifth graders know and understand quite a bit so we are in the position of applying what they know to a new situation instead of learning it for the first time. But the really fascinating thing for me is that, although they 'know their math' they are still challenged by representing it physically. In my reading about mathematics education, I've come across an idea called 'the power of three'. Essentially, the idea is that to really understand a math concept a child needs to represent it in at least three different ways. This would be through pictures or some other means. I'm just beginning to realize that one of the strengths of Math in Your Feet is that it provides an opportunity to experience and represent math concepts in the kinesthetic realm. Part of this challenge lies in the fact that these patterns are not static, but require students to literally be 'in' the pattern. Just today I had an interesting conversation with some boys about whether to record a turn as being on the third beat or on the fourth. We eventually came to the agreement that the turn was actually happening between the third and fourth beat, but that since third beat ended in one position and the fourth beat was in the new position, we had to record it as being on the fourth beat. My system may not be perfect, but it does create a structure to ask these kinds of questions. So, here's how it works. Kids make up a four-beat dance pattern using the elements of percussive dance that I've outlined for them. 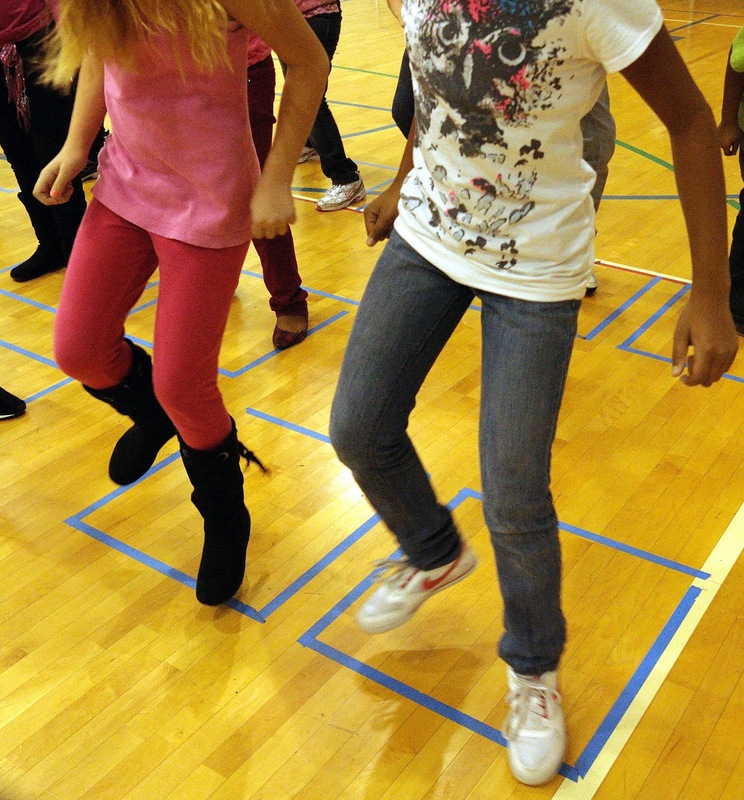 They learn to make their dancing congruent by producing (with pre-teen bodies!) the same tempo, foot placement, movement, and direction as their partner. After that, we start transforming these patterns using different symmetries, starting with reflection. At that point, all the pathways forged between the body and the brain have to be shuffled around as one partner dances the original pattern and the other (on the opposite side of the line of reflection) has to change the pattern by dancing the opposite lefts and rights. For example, a turn to the right would be reversed to go left, or a right foot would be switched to a left foot. This all sounds rather straightforward as I'm writing about it, but after observing the CHA fifth graders this morning, I realize that no matter how well they understand it in their heads, and no matter how 'smart' their bodies might be, it's still a challenge! There's quite a bit of thinking going on here, in both body and brain, and it takes a lot of practice to remember a sequence of the four moves that make up their pattern. This is only the third day and we have a couple more to go. Things do get more interesting and more challenging when we start combining individual patterns into larger ones (i.e. start the second pattern where you ended the first, not at your original starting point and then try the reverse) and also when we transform the patterns using turn symmetry which seems rather straightforward in a static representation on paper, but is absolutely spectacular when you see it in motion. 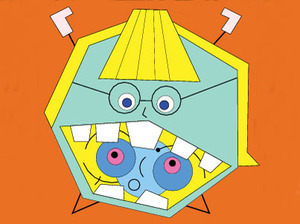 ﻿﻿I happened to be listening to NPR's Weekend Edition recently and I heard a conversation between Scott Simon and NPR's math guy Keith Devlin about this new book You Can Count on Monsters by Richard Even Schwartz. "The book starts with a 20 page introduction, written at an elementary school level. After explaining multiplication, prime numbers, and factoring, the introduction lays out the general idea for the rest of the book, as I'll now describe. 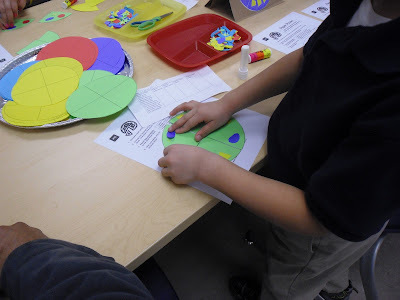 To each prime number, we associate a pattern of dots and a monster. "There is something about each monster that has to do with the prime. Part of the fun of the book is figuring out how the monster is related to its prime. For each composite number, we factor the number into primes and then draw a scene that involves those primes. We also show an arrangement of dots and a factoring tree that helps explain the picture. (A factoring tree is a kind of diagram that shows one way to factor the number into primes.)" 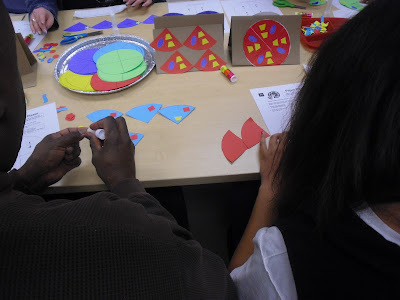 "The thing that distinguishes mathematicians is that we, at some stage in our development, we develop this understanding that numbers do have personalities, they have structures, they have relationships. We form that, but most people don't manage to get it. What Schwartz has managed to do is use his own skill as an artist to bring out some of the personalities, and the point is that what he brings out through his art is actually the structure and the personality that those of us in the business have always seen, we just haven't got the tools and the ability to make it accessible the way Schwartz [has]. It's his skill as an artist that makes this work [emphasis mine]." As a dancer who integrates percussive dance and elementary math, I am in the business of making math accessible. 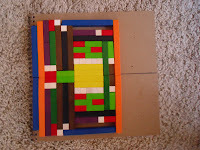 I work to illustrate math concepts through a thoughtful sequence of activities; the children build original percussive dance patterns and learn and apply the math that arises naturally from this creative process. I have spent many years learning and building my own understanding of the math content and practices that relate to this work. And, I have carefully built a learning bridge that makes meaningful connections between the two subjects. 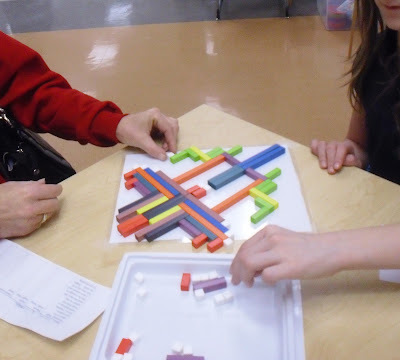 Now that I have built my bridge and my curriculum is where I want it, for now, I have become fascinated with searching for and finding examples of other kinds of bridges to math. I am also trying to figure out just what it is that mathematicians see that the rest of us can't. I'm coming at this task from a couple angles (no pun intended). First, going on some information I heard recently that it is most effective to learn a new language like a baby does (there's been some research findings about this, but I can't locate them right now), I'm working on (re)learning math myself alongside my five year old daughter by exploring math concepts through hands-on experience. And, because I'm not five, I'm also looking ahead to where we might go next. A few years down the line we might both be ready for You Can Count on Monsters. I'm also finding articles and online communities that are focused on how to teach math concepts for comprehension (not just for memorization of procedures) and learning from others' descriptions of how they teach and the kinds of questions they ask students. 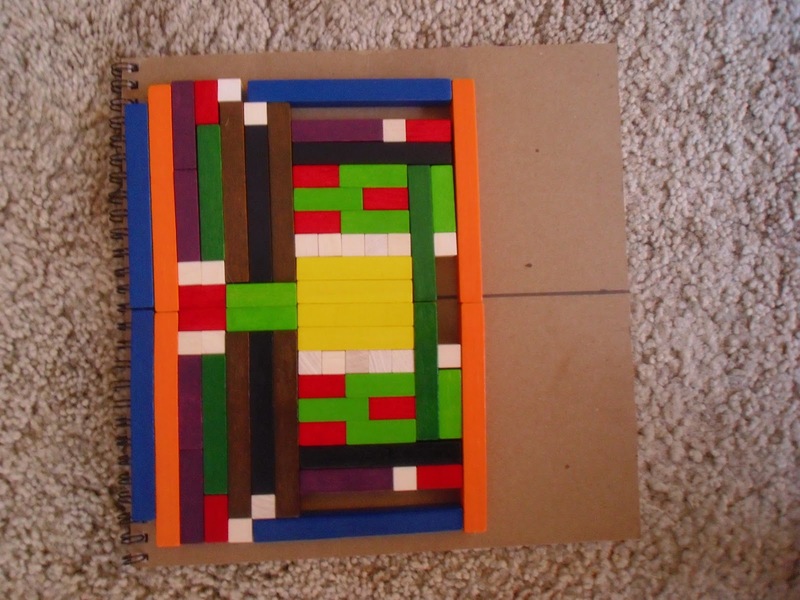 I'm also on the lookout for quality examples of how art in general can help build a bridge to real comprehension of math concepts. Schwartz's monster book seems fit perfectly into the bridge category, in a big way! By the way, not only does Schwartz appear to be a working artist he is also a Chancellor's Professor of Mathematics and Director of Undergraduate Studies, Department of Mathematics, at Brown University. So, happy reading and happy learning! I'm off to the library to find myself a copy! "The artist is accustomed to working in the open spaces of creativity, ambiguity, uncertainty, opinion, and personal story. Woven into this relationship with the discipline is a sense of play. Play may be a key to understanding how people learn and how artistry and scientific thinking are linked. [...] The playfulness of artistry can be absorbing, exuberant, intense, and transcendent. It can provide temporary perfection and sanctuary of mind that is a refuge from the mundane banalities of ordinary existence. Playing often involves rules, but it also includes freedom, imagination, risk unanticipated outcomes, and the possibility for participants to become deeply immersed in the activity." From Mark A. Graham's article "How the Teaching Artist Can Change the Dynamics of Teaching and Learning." Teaching Artist Journal 7.2 (2009): 89. Glue, tape and paper are fun. The more colorful the better. The more choice the better. The following pictures don't represent every activity in the night, but you can probably tell by the focused hands that everyone was engaged in what they were doing. Fun! The Math in Your Feet Family Math Night is called "Pizza, Patterns & Problem Solving." The key ingredients to this night are MAKING and CHOICE. Sure, everyone is designing a paper pizza that illustrates turn symmetry, but every pizza is different. I made up this name pattern activity based on the frequency of vowels and consonants in one's name, but I'm sure it's not an original idea. It's fun to watch kids discover the larger pattern that emerges from repeating their name pattern over and over. This family night is an extension of the Math in Your Feet residency topics. For example, in the dance residency, kids use flips, slides and turns to transform their dance patterns. 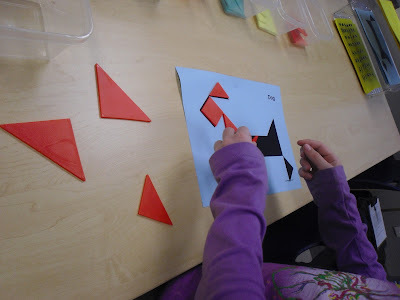 Here they do the same thing with tangram puzzle pieces as they work to make the shadow shapes. This is a night for the entire family, so there are little babies all the way up to grandparents making and solving next to each other. It's quite amazing to see the generations working together, all in one room. I am always heartened to see the adults trying new things. I had heard about the beauty of mathematics, but I never really understood what that meant. Now, I think I'm 'getting it'; not with numbers, but definitely on a visual level. 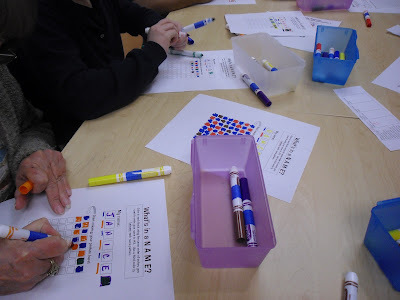 Sue VanHattum from Math Mama Writes posted this video called Doodling in Math Class: Infinity Elephants. When I watched it something just clicked for me. More pictures of tape in action. I've got this idea in my head to find as many examples of tape being put on the floor (or wherever) to further a child's learning, or to change an environment to promote exploration of space. Send me yours! Heading toward the front left diagonal! Find new music and dance to it. Always on the look out for a great tune. 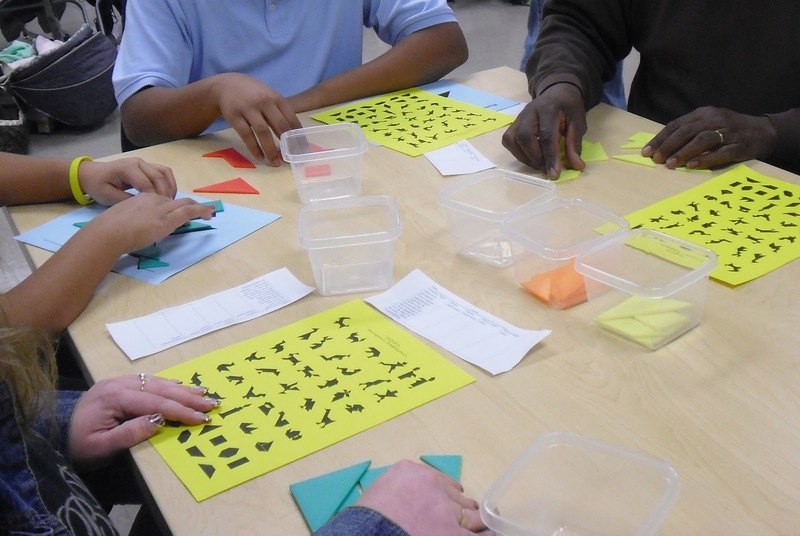 Gestures and embodied cognition in mathematics learning. After reading research findings about this, I've been more aware of how people move their hands while talking, especially when they're trying to describe a procedure or a design. A friend was describing a plaid shirt in her closet; her hands moved across the front of her body horizontally and vertically while she said the word 'plaid'. Find new music and dance to it. Better yet, I'm teaching kids next week! There's nothing like a class of moving fifth graders to keep one in the present moment. 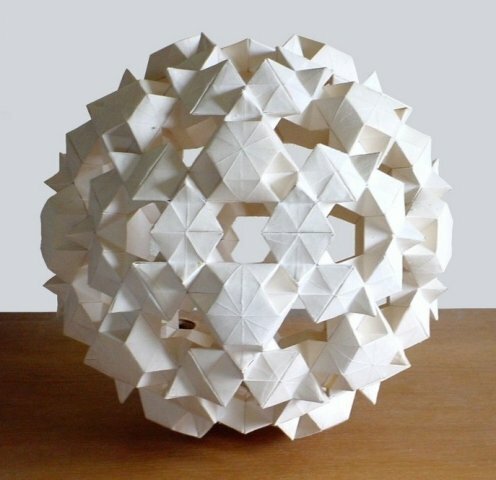 Building an icosahedron by folding paper plates. ﻿﻿How many paper plates will it take? I've made a two-frequency tetrahedron so far, which is four plates. The reason I'm interested is that I've read that Labanotation (a method for notating dance movements and choreography) was created by visualizing the human body inside an icosahedron. ﻿﻿Van Hiele Levels of Geometric Reasoning. Is this useful to me as a dance teacher teaching math? I teach a lot of geometry. I think the kinds of questioning employed that are intended to help move children from level 0 to level 2 might be helpful. Need to look into it more. Learn how to teach math with Cuisenaire Rods using daughter as guinea pig. I wish my math education had consisted of these, but I can re-learn math as I teach my own daughter. These unit blocks are great for developing a real sense of what numbers mean, but when when you grow tired of that focus, you can use them in other ways! I drew a line of symmetry and made up a game where one person puts down a rod, and the other person 'reflects' it on the other side of the line. In this case my daughter led and I followed, but you could take turns in any number of ways. Maria Droujkova from Natural Math posted some very interesting, videos of kids using these rods. 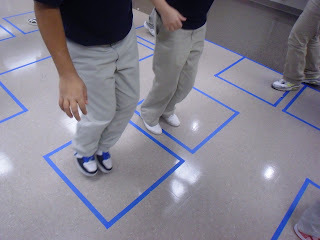 Check Out Math in Your Feet in Action! For the first time ever I have the opportunity to present the Math in Your Feet residency in my own backyard, literally. Thanks to a 2011 ArtsTeach grant from the IU ArtsWeek program, I will be at Templeton Elementary School on February 17-18 and 21-23, 2011. Four classes of third and fourth graders will be working with me each day for one hour. If you are in the area and you'd like to see what this program looks like in action, please e-mail me and I'll send you more details! Also, more information about the program, plus pictures and video, can be found at http://www.mathinyourfeet.com/. I'd love to see you! 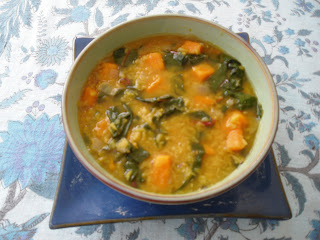 Curried red lentil soup with sweet potatoes and greens. I know a lot of people who make things -- dinner, for example. I know people who grow their own food, make their own music, build their own rock walls, design and build their own houses, decorate their homes with their own artwork, sew their own quilts, and bake their own bread, all as a matter of course. I know people who knit their own socks! Then again, when I go into schools, I meet legions of children who never even considered the possibility that they could make something, let alone their own percussive dance patterns. Here the thing, though -- most kids, even if they don't regularly engage in making things, get excited when it's their turn to make their own dance patterns in class. It's amazing and energizing to watch, honestly. It's like I'm giving them permission to take their rightful place in the human race. I have been reading back issues of the Teaching Artist Journal and finding common themes emerging in what I read. One of the things that comes forward is that many Teaching Artists (like myself) teach with less of a focus on the technical aspects of their art and put more emphasis on helping their students make things within the structure of an artistic practice and process. When a Teaching Artist takes their art into the classroom (or community center, or after-school program, or a nursing home, or wherever people are) they work with people who may have never taken a dance class or made music or used paint in a meaningful way in their entire lives. They usually have limited amounts of time to work with a group of students and so they become masters at helping people make personally relevant art with a limited vocabulary of skills. This is what I do in Math in Your Feet. 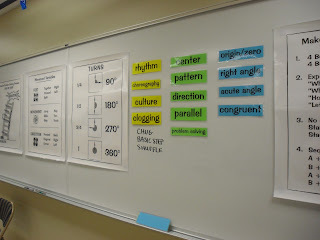 In an upcoming article to be published in April 2011 in the Teaching Artist Journal, I go into detail about a teaching tool I created which I call 'Jump Patterns.' Essentially, Jump Patterns are to percussive dance what creative movement is to ballet or modern dance. 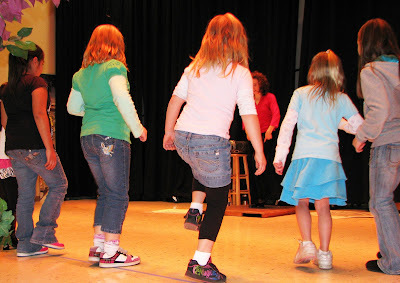 Jump Patterns reflect the elements of percussive dance and allow children to be creative and successful in this particular dance style, but without great need for technical development. Don't get me wrong, skill development is important, but sometimes a focus on technical issues creates a huge obstacle to experiencing the incredible joy and importance of just making...things. Art. Ideas. Music. Shoes out of paper plates. Even having this particular discussion is part of the cultural baggage we carry, a particular mindset that gets activated and reactivated whenever we think of art solely as something to be 'good' at instead of an opportunity to make things. And that's a pity, because I believe that making things is one of the most meaningful activities in which a person can engage. ﻿﻿Right about now you might be asking yourself, 'Just how can someone make something without skills?' The answer is facilitated making. Kids are like everyone else, you do have to give them something to work with before they can begin to create. But, in the end, all you really have to do is help kids explore the medium, find a way for them to investigate the processes of the art form, help them formulate some questions or just wait until one is asked, and, when it's time, add instruction on specific skills when the student is ready for them. Example I: In Math in Your Feet, Jump Patterns are the tool that facilitate the making of foot-based dance patterns. Once a kid learns three of the four elements of percussive dance (leaving out the most technical aspect, parts of the feet) they are then ready to experiment and create their work. They become participants in the traditional aesthetic -- everyone has something to offer, everyone has their own style or take on the dance, everyone is welcome. Not everyone is good but, more importantly, everyone participates. Without participation there is no form. Example II: A Teaching Artist friend of mine works with kids who, more often that not, have no formal music training. When he sets up digital recording studios in their schools they are able to get immediate feedback on their own ideas and find ways to evaluate and adjust their ideas to make real, and often interesting, music and lyrics in a collaborative way with their friends. He spends parts of each class talking about the science of sound or new techniques for using the equipment but mostly the kids experiment on their own and come to him if they have questions. In this case, the facilitation is the TA's approach to using the equipment with his students. Example III: My daughter, who is five, has always had many ideas and many of them get expressed through her art supplies. 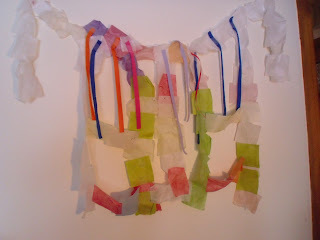 When she was two, she wanted paper cut into shapes so she could make something with them. She had an idea but still did not yet have the skill to cut the paper the way she wanted. Did I say, "Sorry darlin'. You'll have to wait until your hand muscles are stronger and more coordinated before you can get that idea out of your head"? Nope. I cut the shapes for her and she did the rest. Did it change the fact that it was her artwork? Nope. A few years later, when she was a few months shy of her fourth birthday, she had an idea for a mermaid's tail. By then, facilitating her making process simply consisted of making sure the tape was secure so all those little pieces stayed together. Making things is not rocket science...well, unless you're trying to build a rocket. But what comes before that rocket? All the times when kids get a chance to ask questions, experiment with materials, find their own answers and get some help and guidance from adults along the way. We can sometimes get wrapped up in giving kids what we think they need to learn, but it's in the doing where the meaning is made. come flooding in when I have no time for them? Okay, here's my special challenge (and I take comfort in knowing that out there are other people who understand exactly what I am about to say). I am an artist. I am a teacher. I am a teaching artist, curriculum developer, website designer, market research specialist, performer, agent, writer, editor, math student, calf wrangler...I am going insane! Well, not really, but I do feel like I exist in multiple worlds simultaneously, sometimes to the point where I can completely contradict myself and agree with myself in the same moment! Today I was all over those Common Core State Standards I wrote about yesterday. I just spent the better part of the afternoon working with the new language. I'm not making anything new up, just translating what I do, what I've always done, into the language of the most current stated education goals. I've also been working on a grant project for the second pilot stage of Young Audiences, Inc. Signature Core Services program, which has meant working with new forms and terminology. Along parallel lines, I have been spending the better part of my after-the-kid's-in-bed time systematically reading all my back issues of the Teaching Artist Journal (I'm into year five at this point). I started this particular project in December because I figured that, as a recently appointed Associate Editor for this publication, I should probably have a working knowledge of what kinds of articles, topics, research etc. have been published in the past before I move forward with my new position. "Although making art does encourage curiosity, critical thinking, and empathy -- necessary tools in today's world -- these very qualities may also demand that one speak truth to power or insist on beauty. Nourishing imagination may inspire one to declare along with Blake: Everything that lives is holy. Such a vision might make one less suited for production lines, prison cells, or political speech. "So how do we, as human beings and as artists, speak honestly about art? I'm glad that we talk about the connection between art-integration and academic progress, art's value in passing down community wisdom, and the transferable skills that making art develops. But I hope we also remember to say that making art is a voyage into the unknown and, therefore, not a process inherently practical, polite, predictable, or proper." From Judith Tannebaum's article"Oh How We Sparkled: One Vision, Two Themes." Teaching Artist Journal 4.4 (2006): 248-9. I just had a great introduction to the Common Core State Standards (CCSS) for Mathematics! I have to admit, there's always at least a little trepidation in me when I look at a new set of standards. I started as a Teaching Artist in North Carolina, then expanded to South Carolina. Later I moved to Indiana and also travelled to Kentucky on a regular basis. My programs remain the same no matter where I am, and it's been a bit of a bear to 'translate' what I do into the different languages of each individual state's standards. But boy am I in luck now! Now we have the CCSS which are being adopted by most of the fifty states; I am happy about possibly never having to 'translate' my program again, but I'm also really excited about the fact that these new standards are as much about habits of mind and real learning as they are about tiny pieces of specific content. 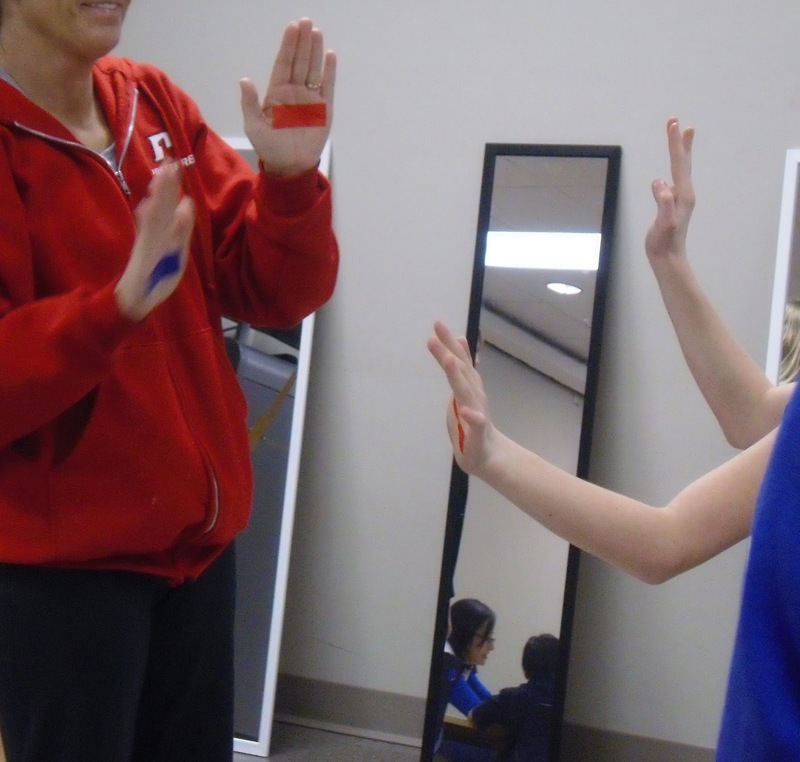 When we first developed Math in Your Feet, Jane went straight to the NCTM principles (mentioned in the above quote) as a tool for finding the big picture connections between percussive dance and elementary math topics. Problem solving, reasoning and proof, connections, etc. have always been at the core of what this program is about but, somehow, the process of parsing it all down into state standards and indicators seemed to dilute the importance of the higher order thinking that happens when kids make percussive foot patterns and learn math at the same time. The reason the CCSS for Mathematics look so promising to me is that the Mathematical Practices standard is at least half of what kids will be required to do in their math classes; my program is a great match for this kind of inquiry and approach. Construct viable arguments and critique others' reasoning. The CCSS appear to be not just a set of common standards and words on the page, but the development of a nation-wide agreement on educational goals and the language used to organize and describe those goals. As someone who has had to learn how to speak the standards language of many different states, I am relieved and happy about having a common language describe my program to schools, teachers and others in the math education world. I'm interested in hearing different viewpoints on these new standards, so please let me know how they affect you!